Enless Soft - Joomla! Extensions - Breadcrumbs Manager - F.A.Q. Enless Soft Products Joomla! 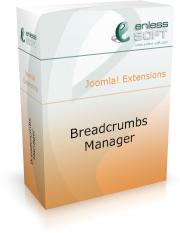 Extensions Breadcrumbs Manager F.A.Q. When do I need Breadcrumbs Manager? Joomla already has breadcrumbs module. Isn't that enough? How do I use Breadcrumbs Manager? Is it possible to use different breadcrumbs patterns for different parts of my web site? I created my own component for Joomla. Can I/or my customers/ use Breadcrumbs Manager to display breadcrumbs for this very component? Q: What is Breadcrumbs Manager? Breadcrumbs Manager is a native Joomla 1.5 extension that allows you to control the breadcrumbs(pathway) in your web site. Breadcrumbs, sometimes also called “pathway”, is the user interface element that shows your current location in the web site. As you can see, it shows you what you are currently reading (“Football derby cancelled”). It also gives you the ability to return to the parent categories (home page, all news or all sport news). "Home", "News" and "Sport" are actually links. Q: When do I need Breadcrumbs Manager? You need it when you have a Joomla-based web site and you want to have control over breadcrumbs displayed for your pages. Q: Joomla already has breadcrumbs module. Isn't that enough? It depends on your needs. It is true that Joomla contains a module that is used for that purpose. The problem is that you don’t have control over what it displays. In many cases default component breadcrumbs are not sufficient. However, if you are happy with breadcrumbs just the way they are, than you don't need Breadcrumbs Manager. Q: How do I use Breadcrumbs Manager? You create one or more breadcrumbs patterns. Each pattern consists of pattern items. There are many predefined Joomla-related items that you may use. They include: current menu, current menu item, current article title and so on. It is also possible to create dynamic items using SQL query or PHP script. An example SQL query item might be a query that selects a name from a table based on current value of a request parameter. Q: How breadcrumbs patterns work? A pattern consists of pattern items. Each pattern item is evaluated in runtime and is transformed into a breadcrumbs item. Example user location: user is reading news. [Home]: this is a static item so it always resolves to the text Home with link to the home page. [Joomla menu item]: this resolves to the current menu item, in our case - “News”. Its link is defined by the administrator of the web site. [Joomla article title]: this resolves to the title of the currently displayed article. In our case it displays the title of the currently displayed news item. Q: Is it possible to use different breadcrumbs patterns for different parts of my web site? Yes. There are two options for achieving that. If you have the Advanced Contexts Manager extension, you could bind a pattern to one or more contexts. If you don’t have this extension you could use strict patterns to achieve similar results. If that is not enough, you can create static breadcrumbs items. Those are items that are added to the pattern based on request conditions. More information on all these methods could be found in the user guide. Q: I created my own component for Joomla. Can I/or my customers/ use Breadcrumbs Manager to display breadcrumbs for this very component? Yes, this is possible. Actually, this is one of the best things you get when using Breadcrumbs Manager - you have a breadcrumbs management system that is not bound to a list of supported components. Even better, Breadcrumbs Manager is easily extendable, giving you the ability to provide users of your component with predefined breadcrumbs items.